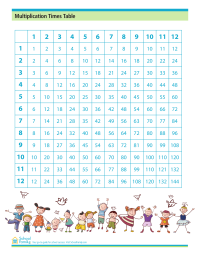 Help your kids practice what they’re learning in school with these fun grade 5 worksheets and grade 6 worksheets. Also, learn more about what to expect from elementary school and middle school. Use this NFL Play 60 writing prompt to either enter the NFL Play 60 contest to win a trip to Super Bowl XLVIII in 2014 or to help children practice their writing skills. 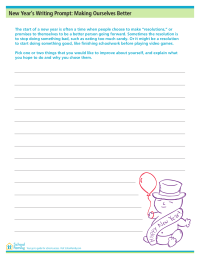 This writing prompt worksheet encourages children to think about resolutions in a way they can understand by asking them to pick one or two things they would like to improve about themselves. 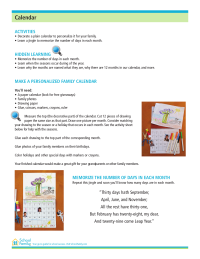 These printable sheets provide a fun way to learn all about the months with lots of fun facts and at-home activities. 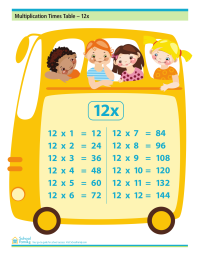 Have your child practice multiplication facts in this 1-12 multiplication times table.